Fire. It can both cleanse or soil, sustain or end life, or perfectly cook or singe delicious, mouth watering meat. Chicago has always been known for their meat products. At one point, we were known as the “Hog-butcher to the world” compliments of one Carl Sandburg due to the presence of the now defunct Union Stockyards that were an engine of industry and the employer of the immigrant masses that called Chicago their new home. Although these legions of cattle and pigs no longer stream into the city by the millions, the ethnic communities have remained a very integral part of Chicago. They are constantly in flux depending on the decade and world politics. On the northside of Chicago, there has long been a large and tightly knit Korean community. Going down Lawrence Avenue, you can still see some of the remnants of the once thriving Koreatown that my girlfriend tells me about when she was younger. Thanks to the Immigration Act of 1965, it allowed these Korean immigrants to finally come in families and establish business that brought the pleasures of the home country to the US of A. However, due to changing demographics and the rise of the Latino population in America, Koreatown now has more of a Latin American and Middle Eastern flavor due to the original Korean families moving to surrounding northern suburbs. However, that doesn’t mean that the food has gone anywhere! Even though I have lived in South Korea and have eaten my fair share of different Korean foods, I’m always down for a quick pop over to a new restaurant that my girlfriend swears by. She hasn’t steered me wrong yet! In this case, we went to Woo Chon Korean BBQ . It is a very tiny restaurant that is wedged between a Korean store that is both grocer and video store next door that has all of your K-drama needs. However, if you want to get some of the best barbecue in the city, this is your place. The waitstaff is also probably some of the nicest you can find in a Korean restaurant since they aren’t known for having the same rules as found in American restaurants. They might be a bit gruffer or forward compared to your typical server in a T.G.I.Fridays, but they know how to make some delicious food. We were quickly seated at one of their simple tables which are a bit cramped if you are six feet or taller like yours truly. We decided to start with kimchi pajeon or a type of savory Korean pancake. It is derived from a Chinese green onion pancake (cōngyóubǐng) yet different because it is made from an egg based mix. The name “pajeon” literally means “green onion (pa) + pancake (jeon)”. While the ingredients seem quite obvious, there are many varieties of jeon that can be filled with different meats, seafood, or in this case, the signature fermented Korean lifeforce known as kimchi. Typically, Janice’s family gets the haemul jeong or fish, shellfish, and octopus pancake, but I can’t get enough of kimchi in any form. It was a ton of food to start off the meal for a reasonable price. It is kind of bready yet filled with crunchy green onions and spicy, crisp pieces of hot and spicy fermented cabbage. As we moved our way through this perfect pancake, they quickly began putting out the banchan or little plates of random Korean snacks like pickled cucumbers, cellophane noodles, pickled radish, and even the mysterious acorn jelly that looks like cut up, corrugated pieces of rubber. It’s not at terrible as it sounds but not my cup of tea. As well as bringing out the small plates, the server also provided us with a blazing hot bowl of coals for cooking our orders of kalbi or beef short ribs. Korean bbq has been a bit of a recent phenomenon in American cuisine, but it is a form of dining as old as time. In Korea, eating beef was a great privilege since the cattle were beasts of burden, and the Koryo Buddhist dynasty of rulers forbade the consumption of meat. However, in the 13th Century, those crazy Mongols invaded and removed the ban. They were pragmatic nomads, but they knew good food too. However, beef didn’t become prevalent on Korean tables until the latter half of the 20th Century as South Korea quickly became the advanced nation we now know. History lesson over, we threw the raw pieces of meat on the grill with a satisfying sizzle and pop. Once Janice grilled them to perfection, we mixed them with rice, doenjang (soybean paste), and banchan in leaves of lettuce to create ssam bap or what could be described as lettuce wraps with plenty of savory flavors to enjoy. We also got a side of pre-prepared dwegi bulgogi or sliced pork loin that is sauteed in a soy based sauce infused with ginger, gochujang (chili sauce), garlic, sugar, and rice wine. It wasn’t on the menu but highly recommend this Korean classic. It also has a bit of a spicy kick to it if you’re not feeling the more mild grilled meats. I loved mixing the pork’s zing with the green onions that came with the kalbi. It provided a definite earthiness that mellowed out the grease of the meat. We also got an order of moo guk or literally “radish soup”. If there’s one thing Korean soups and stews are known for, or at least what I’ve noticed, is being absolutely as hot as the surface of the sun, temperature-wise. While it takes a bit of time to cool off, the taste alone is worth it. Plus, if you’re looking for a bowl of comfort food during these cold Chicago months, step aside mac ‘n’ cheese, get a warm and filling bowl of soup. By the end of the meal, we were stuffed to the gills with great food, and we were ready to take on the cold climes outside. So if you’re looking for a more low-key Korean bbq place that isn’t packed with everyone who wants to experience the novelty of grilling meat at their table, I’d recommend Woo Chon Korean BBQ. Oh yeah, and the food is mouth-watering to say the least and easy on the old wallet. Posted in Far East Asian Cuisine, South Korean and tagged banchan, bbq, bulgogi, Chicago, guk, kalbi, kimchi, onions, pajeon, soup, sour, South Korean, tang, Woochon. Bookmark the permalink. What is up, everyone out there? Welcome to the first installation of many on Mastication Monologues that is a retro series of food adventures I undertook throughout Europe while living in Barcelona. I know there are many stereotypical dishes to try throughout Europe like fish and chips in England, baguettes and pate in France, or tons of different tapas in Spain to name a few. Believe me, I’ve tried them, and they all were delicious. Instead, I’d like to highlight more unique plates and snacks that you might have never even heard of and might want to try or maybe not. Today’s post brings us to the farthest eastern point of my wanderings: Romania. Romania is an anomaly in Eastern Europe. Not only do they speak a language that falls into the Romance category alongside French, Italian, and Spanish while being surrounded by Slavic neighbors, but their most famous celebrity is the infamous prince of the night, Dracula. 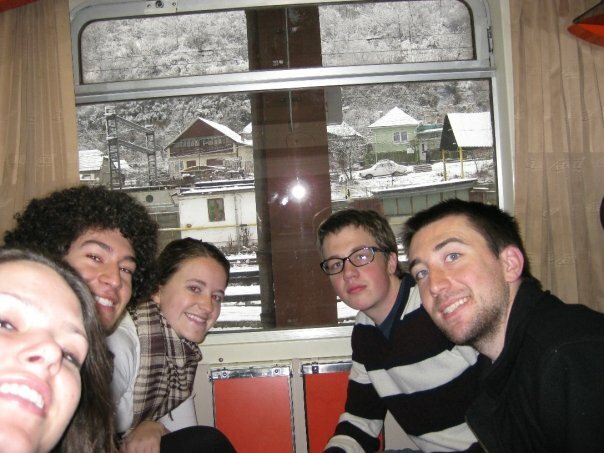 I went there in December with my friends Kevin, Steph, Jesus, and Jillian, and it was probably the best trip I ever took during my time abroad. We all approve of our new house. My travel companions, the wild environs including wild dogs in the airport, and just the general randomness that seems to be more prevalent in Eastern Europe made it a journey to remember. The food was a mix of Slavic and Latin flavors with a leaning more toward the former, and one meal that really stood out to me was something called mămăligă. Since it was the beginning of December, it was quite chilly, so we didn’t spend a lot of time sitting in parks and enjoying the local flora and fauna in Bucharest. We quickly found a folk restaurant and appreciated the warm room and comfortable places to sit. It looked like a more upscale place based on the spotless floors and walls, but it also seemed more traditional in its decor. While many restaurants in America may give you a free bread basket or tortilla chips with salsa on the side, this place supplied us with a complimentary plate of assorted pickled vegetables along with a free shot of vodka. I’m sure the pickled cucumbers and spicy peppers were used to chase the strong spirit, and the alcohol warmed us up quite quickly. We looked over the menu, and I couldn’t really decide what to get. The staff didn’t speak much English, but I saw there were terrible English translations under the Romanian items. One caught my eye called balmoş (sometimes spelled balmuş). It just said it was made of mămăligă, butter, cheese, sour cream, and eggs. The waiter seemed happy with my choice, and it really piqued my attention once it came out. it was served in a small bowl. It looked like a yellow and white porridge with bits of sausage on top. 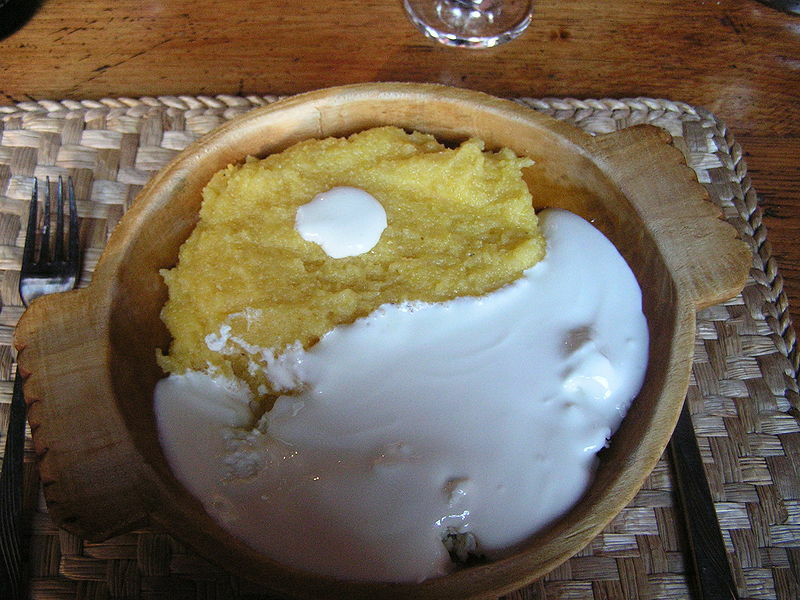 After doing some research afterward, the yellow was the mămăligă or a porridge made of yellow corn. It is normally boiled with water and can serve as a substitute for bread, but for this balmoş it was boiled in sheep milk. Along with that fun tidbit, I found out that this dish is a specialty with Romanian shepherds. So, I grabbed a spoon and dug into the bowl to find layers of sour cream, telemea (a type of feta cheese), caş (a type of fresh curdled ewe cheese), urdă (a type of curdled cheese). Thank God for Wikipedia to explain all of those cheeses to me. 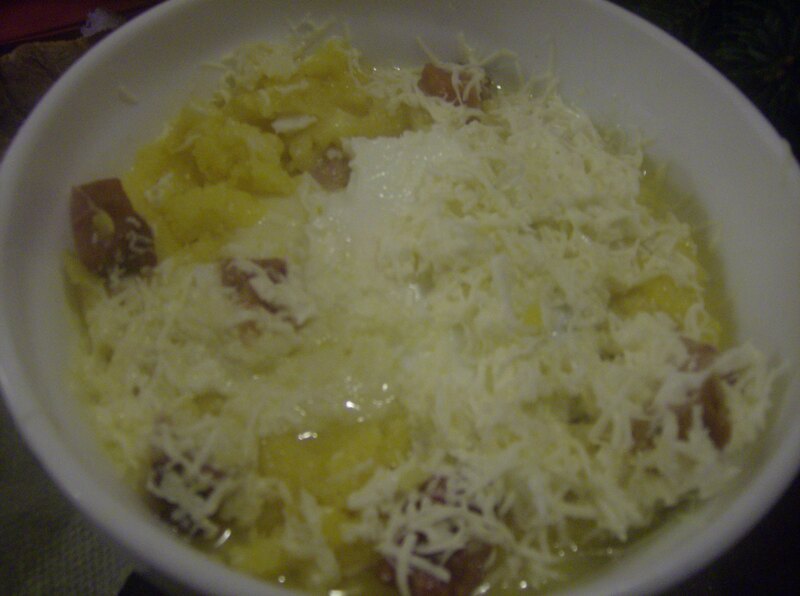 The cheeses were strong and pungent yet softened by the sour cream and porridge. It wasn’t a huge bowl, but it really stuck to my ribs for the rest of the day/night. I could tell that the Romanian shepherds perfected this recipe for long, lonely stretches in the wild. 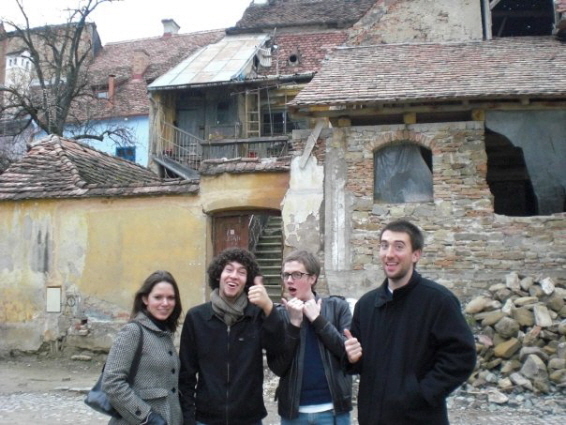 However, I was surrounded by friends and having the time of my life in Romania. So if you want perhaps a Romanian vegan take on chili or are in Bucharest and looking for a fading piece of the past, try the mămăligă! Posted in European Cuisine, Romanian and tagged Bucharest, bulmos, butter, cheese, cream, egg, fried, goat, mamaliga, peasant, Romania, shepherd, sour. Bookmark the permalink.